The Spring Creek hike in Kanarraville, UT, was one that far exceeded expectations and I would recommend it to anyone looking for a great day hike. 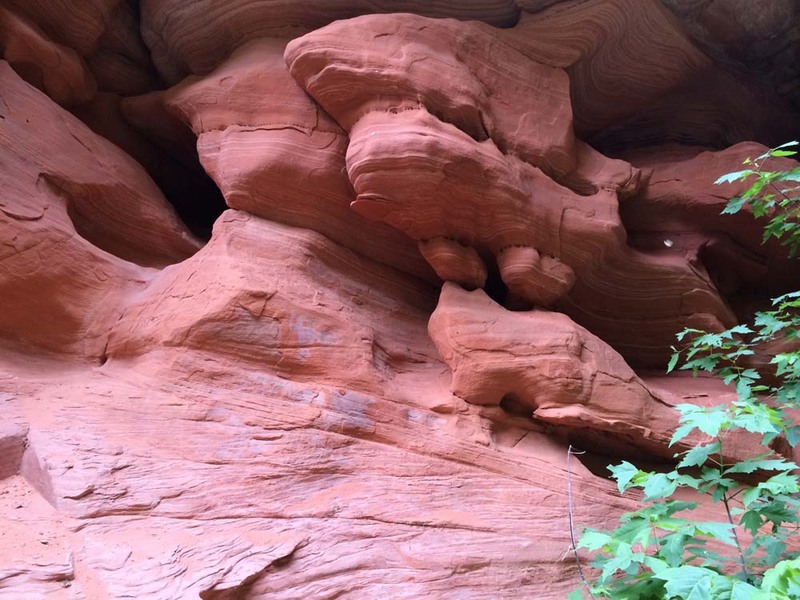 This hike, like Kanarra Falls, features many of the rock and plant characteristics and profiles that are so prevalent in Kolob Canyons with a nice slot canyon thrown into the mix, and because of the elevation increase, it was about 15 degrees cooler there than in St George! Directions to Trailhead. From St George, head north on I-15 for about 33 miles and take exit 42 to New Harmony/Kanarraville. Turn right on Hwy 144 and take an immediate left onto Harmony Ridge Dr/Old US 91. Continue about 3.9 miles toward Kanarraville and take a sharp right onto the dirt road that intersects in the shape of a V. This road will take you out to the down softball field. Continue on this dirt road for about .7 miles. You can park here, or if you have a high clearance vehicle you can take the road to the left and drive in another 700 ft or so, where you will see the road closed. Park and hit the trail! We headed up I-15 early so try an beat the heat. 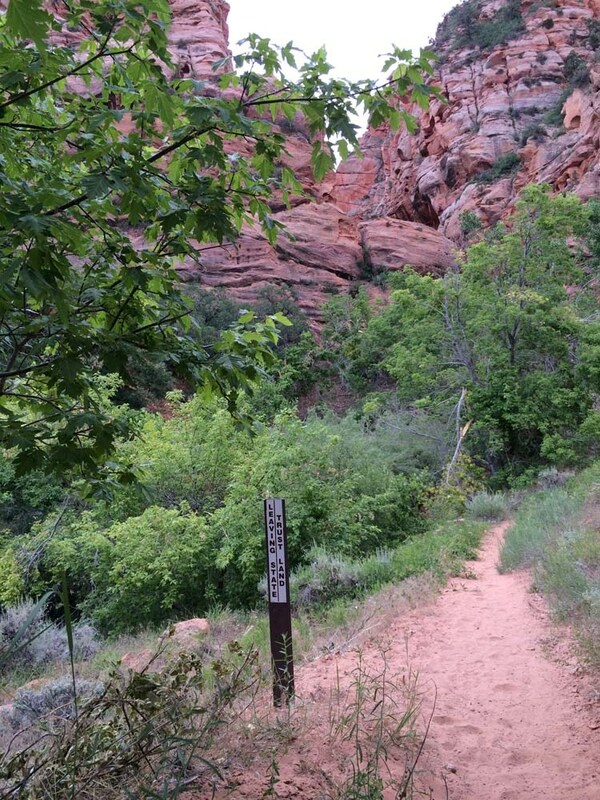 It’s hard to find hikes to do in St George when the summer heat comes on, unless you are just willing to bear it. I wanted to find something that would be cool, beautiful, and that my hiking companions would enjoy. However, I wasn’t able to find much information on this hike, so I really felt as though I was flying blind and didn’t have a clue what we would find when we got there. After arriving at the trailhead I thought, “Well, this is nice…” I wasn’t overly impressed (my expectations raise a few points when I take people for a hike and I get nervous about them enjoying themselves) – but I reminded myself this was just the trailhead. We jumped out of the truck and looked around. The first pleasant surprise was that it was so much cooler than St George! We were also happy to find the creek running nicely right next to where we had parked. The mountain walls on either side of us were some kind of conglomerate rock mix up with sandstone and you could see ‘wave’ type formations in them where presumably those layers had been pushed up during some type of tectonic plate movement. That I found to by quite fascinating. We moved on up the trail and enjoyed following along the creek for a little ways. The beginning of the trail is an old ATV trail that the US Department of National Interior is trying to eliminate. We followed it for probably the first mile before the trail turns into single track. Eventually the trail pulled away up to the right from the creek, but we could still hear it running softly nearby. The transition in scenery and plant life as we progressed on the hike was kind of astounding to me. Again, and not to sound ungrateful for my surroundings, the initial impression of the trail was a few juniper trees, sage brush, and a wide open canyon that seemed kind of uninteresting. Well, my interest quickly peaked, and I’m so glad I kept moving forward! About the time the trail turned from ATV to single track the plants started to get closer on the trail, and we moved around a little hill that was obstructing our views and all of the sudden we got a glimpse of the place before us that we were heading to. Off in the distance we would see high red sandstone cliffs jutting into the sky. The foliage around us was starting to change to resemble that of the Kanarra Falls hike mixed with the Kolob Arch hike. Just then we crossed over the creek again and found that we were rapidly approaching the slot canyon I had read about. By the time we reached the mouth of the slot were again enjoying the close companionship of the stream. However, the stream that had so meticulously cut this chasm in the earth was soon overshadowed by the amazement we felt for the work it had done! You’ve seen the pictures of the wavey sandstone in Antelope Canyon…well the wall at the mouth of this canyon were very much like that. The formations were spectacular and the plants in the canyon were just green and lush. This trail just kept getting better and better. We pushed on, accompanied by the stream for another 3/4 miles and then it suddenly disappeared. The trail had taken us up and around a rise and when we came back down to meet the creek it was gone (on the trip back we investigated and found that the stream was fed by several underground springs). We walked up the dry creek bed for another 1/2 mile until the going got much steeper and more rough and decided to turn back. As we sat enjoying a little snack before heading back we all felt the same as we talked about the hike – we were glad we kept moving forward and didn’t let our initial impression of the trail thwart our journey. It actually turned out to be a great hike with spectacular views! My philosophy proved trued again on this hike…the real beauties of this earth are reserved for those who are willing to go out and find them!